We use an email list to send out announcements about club related events and activities. You do not need to be a member to be added to our list and receive the announcements. Typically there are four emails a month, one at the beginning of the month announcing the producers’ picks for the month and three reminder emails for the two film screenings and the film discussion. If you are signed up but not receiving these emails please check your spam, junk, promotions, or marketing folders to make sure they are not going there instead of your primary inbox. If you add the TFC general distribution email address (now.playing [at] tacomafilmclub.org) to your address book this should alleviate the problem. Often, merely dragging the TFC emails to your inbox one or more times should “train” your email program to treat the TFC announcement emails as regular emails over time. Gmail App Users: TFC emails will always go to your “Promotions” folder (not your “Primary” folder) unless and until you move the TFC email to your “Primary’ folder a few times. TFC emails should also be found in the “All Mail” and “Important” email folders. NOTE: We do not sell or give away the names or email addresses of those on our list to any third party. 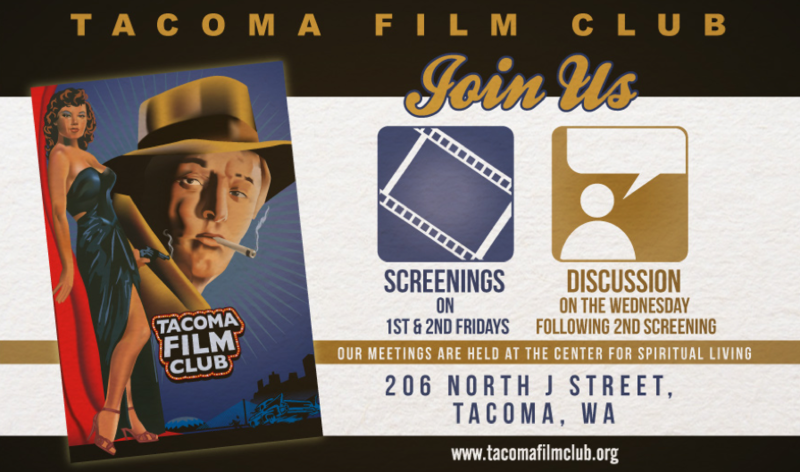 Also we do not use the email list for any other purpose than sending out Tacoma Film Club related announcements.